Adriana Cuervo has served as Associate Director of The Institute of Jazz Studies (IJS) at Rutgers University – Newark since 2013. Before coming to New Jersey she worked at the Sousa Archives and Center for American Music at the University of Illinois at Urbana-Champaign. 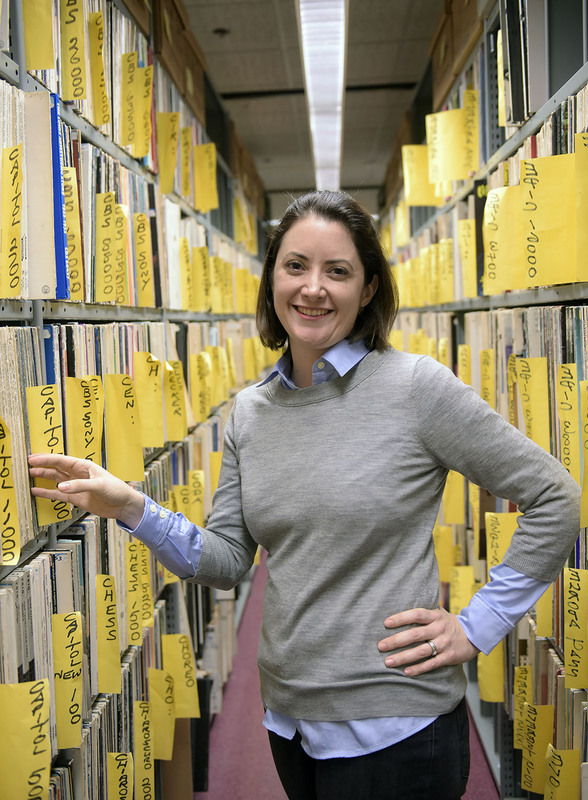 Cuervo spoke with Section social media intern Lily Troia this past fall about her background, managing music and cultural heritage collections, and the nuances of appraisal and acquisition activity at the world’s foremost jazz archives and research library. Cuervo highlights strategies around copyright, the value of taking good notes, and the necessity of strong collection inventories. She also discusses acquisitions goals in relation to Rutgers’ on-going diversity initiatives and the Institute’s position within the New Jersey and broader jazz community. Can you share a bit about the path that brought you to IJS? I came to the IJS in 2013. I was not looking for a job, but I saw the opening. It was in a music archives, and I thought, “Oh gosh, this is very rare, very random.” I had assumed whenever I left Illinois it would be to go to an archives with a broader collection scope, more traditional university archives/special collections. Since this was a music archives and a management position, I thought, “If this is not it, I don’t know what is.” It was a really appealing job because of the stature of the IJS within the jazz community, and because there is a lot of work to be done. The archives was built and sustained for over 30 years by very talented, well-known people who brought in amazing collections. That is the reason we are here today. However, once things came in the door, they moved onto the next big thing because big things were happening. We have a lot of collections work to do. We need to straighten out our holdings, and put them at a level with which I am comfortable, in terms of preservation and access. In terms of my role in the IJS, I have four areas: I oversee the archives, and all archival operation is under my purview. I handle marketing and communications for the institute, which we are managing more strategically, focusing on engagement. Obviously the more time you have to put into things like social media, the more benefits you get, but I think for the amount of time I am able to put in, things are going well and improving. I identify, design, and oversee digital projects with our collections, and frequently partner with other departments, like our digital humanities librarian, Krista White. We are applying for a couple of grants to digitize different collections, and are putting our oral histories online. She does the technical side and we provide the jazz expertise, and the content to go online. We have also identified pockets of materials that are good candidates for digitization, taking into consideration fragility of the medium. We have a lot of tapes that smell like vinegar, and sound recording collections on obsolete media that are good candidates. The fourth area, I work with Ed Berger, Special Projects Consultant, in the programs we offer—the jazz fellowships, the archival fellowships, and the research fellowships. I am getting to learn the administrative ropes of those programs with the understanding that I will take them over upon Ed’s retirement. What role do you play in terms of acquisitions and appraisal at the IJS? We do our appraisal in more of a group effort. We get offers of things on a daily basis. Everyone has the greatest jazz record collection, or all the books of so-and-so they want to donate. For potential archival materials we discuss as a group, and we weigh the pros and cons, asking essential questions like, where are the materials? We try not to acquire things unseen, which is a double-edged sword (or Russian roulette). We talk out all the scenarios, discussing questions of copyright. How much do copyright concerns impact acquisitions decisions? Ideally we would like to have the rights come to the institute with the materials, but we realize these are often performing musicians, and there are other people who have an economic interest in their work. It might not be feasible for them to transfer rights to this institute at this point, but we do make sure that the donors are aware that even though the copyright still resides with them, they need to make succession plans for that property. We are being super militant about clearing the rights question, especially since my and Elizabeth Surles’s (IJS archivist) arrival. We need to know who owns the rights to the materials, because people are going to want to make copies, want photographs for publication. There is nothing worse than having someone come in and find exactly what they need, and have to tell them, “Sorry, you can’t take it. You need to find the rights holder; I don’t know who it is. You’re on your own.” That is not how I would like to see us operate. We need to at least keep good files on the collections that we have. Eventually we will reach out to the donors’ heirs to see if they are willing to transfer rights. For example, there’s a collection of photographs that the donor decided not to transfer copyright to the IJS, but we have a non-exclusive license to use his materials in research. The deed of gift specifies the resolution we can give to researchers, and allows us to use materials to promote the Institute. Anything in large format or high resolution would go through his licensing agency. That is a great model for us. Since I came on I have been working to organize our collection files. Previously documentation was scattered—different people had different pieces of the acquisitions files. We have been putting them in one central place. We are old-fashioned. Every time we finish an acquisition we print out our emails and notes from phone conversations and put them in the file. You never know. It happened to me actually on the first acquisition I ever worked on! It was the Eddie Bert papers. He played trombone and died in 2012. He was a very well-known trombonist. He played with everyone and their sisters: Stan Kenton, Benny Goodman, Charles Mingus. He was in high demand. He played live, and also recorded for film scores. We got a call from one of his daughters who was the executor of his estate. She called when they were cleaning out his house and said she knew her father would have wanted his materials to come to the IJS. Bert had a long-standing relationship with our then- director Dan Morgenstern, so we acquired the materials from Connecticut—photographs, his instruments, etc. A deed of gift was signed. Then maybe in 2014, another family member called expressing discontent that Bert’s materials had been given to the IJS. We had been unaware there was any contention with the executor’s decision. It required some delicate negotiations. We got our counsel to weigh in, who determined the executor had acted in accordance to the law. But we wanted to reassure the upset family member, which took several sympathetic conversations, offering an open invitation for their family to come to the Institute whenever they wanted to see the materials, and that we would include them in any concerts or exhibits involving the collection. That was my first acquisition on the job; and, about a week into the job here at IJS. But, I did keep good notes! So you worked to make the unhappy party a stakeholder in Bert’s donated legacy? Definitely. You want to help someone come to a decision themselves that hopefully aligns with your goals, but you never want to antagonize them. The IJS is known as the world’s largest and most comprehensive jazz archive. Considering jazz is such a massive topic, are there currently narrower areas of scope in which you are focusing new acquisitions? We are definitely the world’s largest and most comprehensive jazz archives, yes. I wouldn’t say we are narrowing our areas of scope, but what we are really working on is a complete collection inventory as compared to our 2010 list. Then we will assess what we have, and hopefully set up a collections map, breaking down by instrument, time period, musicians, etc. We might realize we don’t have enough, say jazz tuba. We do know that our collection strengths move past the 1950s and into the ‘60s a bit, but then decline. That is a more contemporary collection area we want to pursue, but many of those musicians are still living and performing. Over the years we have acquired various materials, like a huge amount of big band stock arrangements, and now we realize we have twelve collections with stock arrangements, so perhaps we could have steered these donors to go somewhere else? We cannot do that though, unless we know what we have. We are focused on really pinpointing those areas so we know how to fill the voids. Will you deaccession any duplicates? No, I think we will just chalk it up as a learning experience. That is one thing this collection-wide survey is helping us realize. There are a lot of photocopies in our archival boxes. People would randomly photocopy things and bring them to the Institute to donate, and they might be already archived in original form at the Library of Congress. We really do not need to be holding on to these in archival form, though they could be moved into the reference section. This survey is yielding those kinds of results, so we will be able to see the bigger picture once it is done to inform future acquisitions decisions. Rutgers is among the nation’s most diverse universities, with an ongoing commitment to new initiatives aimed at continued improvements in this arena. How do the IJS, and its acquisition goals, fit into this mission? Diversity is a big theme that runs through Rutgers – Newark and the Rutgers University Libraries. I think the Institute itself was founded in that same spirit: no one thinks jazz is worthy of serious study, so let’s do it. That has always been in the back of our minds. For example, we do not just collect the papers of famous people. That is an area I think is worth thinking about critically—the role of, say, K-12 music educators. These are the people that are at the grassroots of teaching and inspiring kids towards careers in music. These are the first lines where children get acquainted with jazz—wouldn’t it be nice to say we are representing that segment of the population in our jazz collections? That is something that needs more study, and requires us to get to know the players and the people. We recently got a grant from the New Jersey Historical Commission to arrange and describe collections of four native New Jersey jazz musicians. One of them, Harry Leahy, a guitarist who was very well known in the local area, but was not, by any means, a big, touring name. But he really brought jazz to a lot of people in this state, and taught at Paterson University, Essex County College, and other local spots where a lot of the gigging musicians in the area got their education. He was really meaningful in the local scene, and as I put it in our grant, he is someone that really deserves the recognition, and to have his contributions documented for the future. So yes, we are always thinking about diversity, always thinking that there are many, many points of view, and that the historical record should reflect all of those points of view. Interview conducted and written by Lily Troia, Social Media Intern. SAA does not assume responsibility for the opinions and views published on this blog and any reference to commercial interests (such as vendor listings or advertisements) does not imply endorsement by SAA. Comments and guest posts made on this blog do not necessarily represent the opinions of all members of the section or steering committee, or their employers.